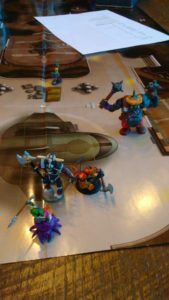 Savage Worlds Rifts – Pretty awesome, I’m a fan of both Rifts and Savage Worlds and using the latter game system solves a lot of the problems involved in the former’s setting. 2.) Ravnivori Empire – Mine, obviously. It went surprisingly well. I ended up with the curmudgeon crew so I was a little nervous but they just wanted to do cool things and I just like letting people do awesome things so it worked out. The highlight was probably when they one-shotted the master bad guy by defenestration because he was watching the battle below from a window. 4.) 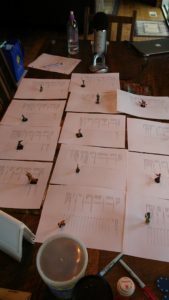 Dogtown – a homemade system and setting. We’re Irish mobsters in prohibition era Missouri. Highlight here was the final scene where one of the players turned on the rest of us and got tommy gunned down then I killed a rival mob boss. 5.) 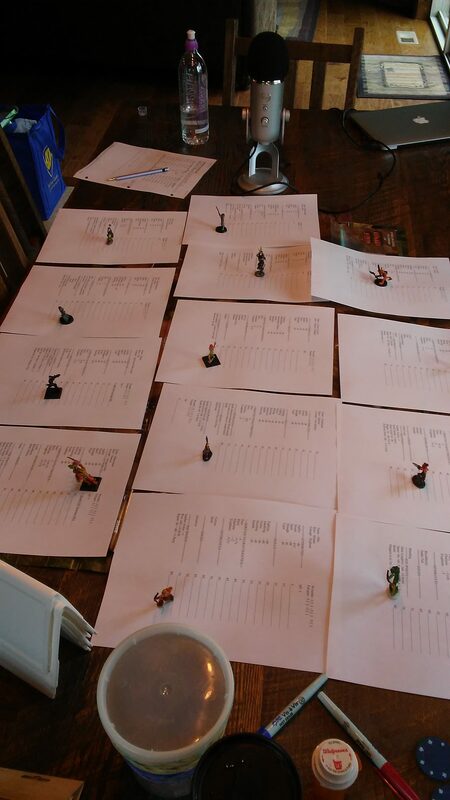 This Empire Earth – Another Homebrew by the organizer of the Con. I was in on the ground floor of this setting and I’m still playing my original character. It’s funny because none of the party has ever died while I’ve played in a session but when I’m not there, there are inevitably casualties. Highlight here was when we turned the living ship from beyond our galaxy that was trying to eat us onto the cyborg bounty hunter that was after us. And, as promised, here is the plot for my game. Things in <> are where the party diverged from my plan and/or their actions. Mancon year 3– King Under the Hill story. All in all, it was a sweeping success. I’m already thinking of adventures for Mancon 2018! Here are the pregens I had out and their associated miniatures. I had 13 options for the players. And the penultimate moment in the adventure just before they shoved the goblin leader (at the very bottom) out the window. I’m sure that I have a good excuse for why I haven’t posted a blog in 2 weeks, but I can’t think of it and I won’t insult both of us by trying to come up with one. Especially since I was so sure I was going to be back on track after the last one. Anyway…Mancon is next week, so there definitely won’t be a post then. I’ll be busy running a game in this world as opposed to just writing about it. The next week, I should have another plot device with the details of my planned plot and the actual plot that arose when the pesky players mess up my beautiful idea. Obviously, the military is an important part of the Ravnivori Empire. They are in the midst of active conquest, after all. While there is a standing military, it’s function is to maintain the peace on the homeworld and protect it from any invasions, now that they know it is possible for offworld armies to attack. Most of the offworld work is done by semi-official mercenary units. These units are sort of adjuncts to the regular military and are at the service of any loyal Imperial citizen who needs some soldiering done. As they are not officially part of the military hierarchy, there is little in the way of standardization in uniform or methods. And, in fact, their adherence to these sorts of things is considered far less important than their efficiency.